Benjamin Gilmour is an author and filmmaker, director of the films 'Jirga‘ (2018), 'Paramedico' (2012) and 'Son of a Lion’ (2008), author of the books ‘Paramedico – Around the World by Ambulance’ (HarperCollins), a tie-in with his recent film of the same name, and ‘Warrior Poets’ (Pier 9) about the making of his first feature film in Pakistan. 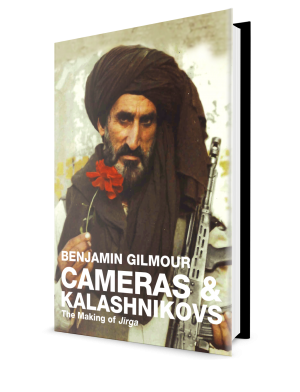 His latest book 'Cameras & Kalashnikovs' (Ahoy) is a behind-the-scenes account of his time making 'Jirga' in Afghanistan. He is based in northern New South Wales, Australia, where he lives with his wife Kaspia and three children, Paloma, Romeo and Bohème. You too can visit some of the spectacular locations seen in our film Jirga. While some parts of the country are out of bounds, the central provinces and some northern areas are fine and make for an unforgettable travel experience. I have collaborated with the local Afghan producers and guides I worked with on Jirga to start AFGHAN ADVENTURES travel company. Get a group together now! If you believe in my work as a filmmaker and would like to support the development of future projects, please donate to Benjamin Gilmour’s Film Fund. Promoting social justice via film comes at a cost and every bit counts. When making PayPal donations, mark your contribution ‘Film Fund’. Many of the Afghan actors Benjamin Gilmour works with ordinarily live on less than a dollar a day. If you would like to support these actors with donations that will improve their lives, please mark your PayPal gift as ‘Actor Fund’. Many thanks! @2018 - Benjamingilmour.com. All Rights Reserved.